These girls are bringing a whole new show to Capitol Hill. Do you remember Bush's second inauguration concert in 2005? Probably not, since its headlining performers were Hilary Duff, Ryan Cabrera, and 3 Doors Down (Kid Rock was denied a place on the bill following an outcry from pro-family groups). So who could possibly be blamed for being a little excited for this afternoon's HBO-presented, Obama-welcoming "We Are One" concert featuring U2, Beyonc&eacute;, and Bruce Springsteen? Surely, by default, it would have to be the greatest, least lame president-elect-sanctioned musical event in history, right? It actually sort of was! Most of the performances were decent enough: U2 played "Pride" and "City of Blinding Lights" without major incident; Springsteen generously opted to sing "The Rising" instead of something from his cheesy new album; Usher and Shakira failed to desecrate Stevie Wonder's "Higher Ground," mostly; and Mary J. Blige's version of "Lean on Me" was sort of awesome, even more so because her coat was the exact same color as the backdrop, which made it look like her singing head was creepily floating over the steps of the Lincoln Memorial. Hilariously, pulled-from-retirement Garth Brooks seemed to have the most success with the freezing audience, which quite reasonably decided that dancing to his "American Pie" and "Shout" was probably more fun than standing still and dying from hypothermia (we enjoyed both songs, really). 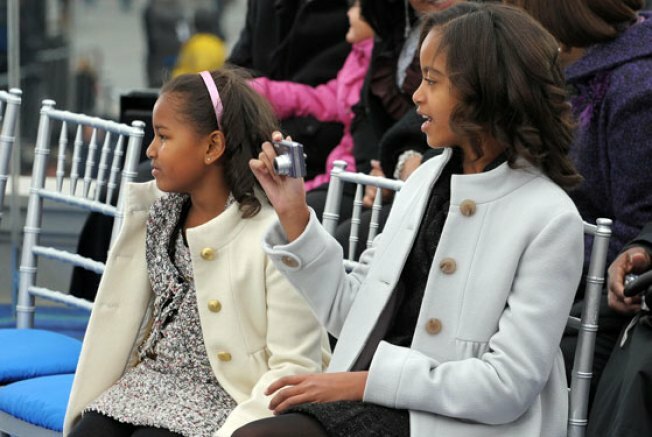 But while our president-elect, seated stage right, showed steely resolve by nodding and singing along through even the most terrible performances, heroes Sasha and Malia Obama bravely broadcast their non-enjoyment by looking completely bored (Malia) or falling asleep on their mom's lap (Sasha). When they liked something, though, Malia showed it by excitedly snapping pictures with her camera (neither First Daughter liked Mellencamp, Will.I.Am, or Crow, but both are apparently big fans of Beyonc&eacute, Usher, and Kal Penn). They are our new national conscience. Can somebody get them onstage seats at the Grammys? Breaking: Matthew Weiner Signs a Deal; Mad Men Safe!